1. Freshwater shrimp: These fun invertebrates are very easy to obtain for any freshwater aquarium setup. What you usually find in pet stores are ghost shrimp (Palaemonetes spp.) which have a see-through body, hence the name. Ghost shrimp are relatively inexpensive to purchase, usually 64 cents each. These shrimp are very easy to keep in the home freshwater community aquarium and they breed easily. I would recommend keeping a shrimp per gallon because they can become aggressive if overcrowded. They are considered to be scavengers on dead plant or animal matter that happens to be on the bottom of the aquarium. 2. Crayfish: An interesting and active invertebrate that is easily found during warm summer months in ponds, ditches and lakes are crayfish (around 150 different freshwater species). These feisty crustaceans are slightly difficult to keep than the previous crustacean. First, you should not keep multiple crayfish in an aquarium unless the aquarium is very large (55 gallons +) due to crayfish being very territorial. Second, you want to make sure they have pristine water conditions. You can tell how healthy your crayfish is by the color of their exoskeleton. 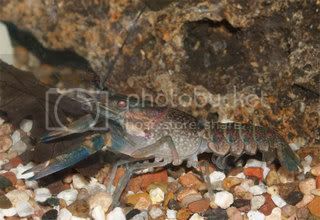 Lighter colors (white, cream) usually mean poor health, while darker colors (deep red, deep blue) mean a healthy crayfish. And last, make sure you lock the lid of the aquarium down because crayfish are escape artists. These guys also scavenge on dead plant and animal material found in the aquarium. 3. Clams/Mussels: A different approach to invertebrates are the mollusks. Usually when you think of clams you think of saltwater giant Tridacna clams. Freshwater clams do not have much color variation as the saltwater clams but they do aid in water filtration and in decreasing nitrate levels. I have found these with some online suppliers but never in a local fish store. They require little care and are great additions to any freshwater aquarium - just don't add more than one per ten gallons of water! 4. Snails: I personally can not have too many snails in any of my aquarium (unless there is a puffer in it!) because they are easy to keep, help keep the aquarium clean of decaying plant and animal matter and are fun to watch. Snails are possibly the easiest invertebrates too keep in any freshwater aquarium. There are hundreds of neat freshwater snail species occurring in all shapes, colors, and sizes! Don't forget to check out Six Great Live Food Choices for Freshwater Fish, Four Algae Eaters for Freshwater Aquariums, and the rest of our Freshwater Aquarium articles! Don't miss out on future updates - subscribe to our free RSS updates, or free weekly newsletter! I certainly agree with your that shrimps are a good addition to freshwater tanks. I don't believe ghost shrimps (Palaemonetes paludosus) breed in aquaria because they have larvae offspring, but many other shrimps will breed freely, including the excellent cherry shrimp (Neocaridina heteropoda). Crayfish are fun in some ways, but the aren't community animals, and I think it's worth mentioning that they'll also eat aquarium plants. They're omnivores in the wild, and will really eat just about anything. Now, clams are where I really disagree with you. They don't live in freshwater aquaria: they merely die slowly. At least (marine) giant clams get some of their nutritional needs via symbiotic algae; freshwater clams are entirely dependent on plankton they filter out of the water. Moreover, the most commonly traded clams are coldwater animals, and in tropical tanks quickly die anyway. The standard tropical clam is Corbicula fluminea, and while hardy in the wild, its lifespan in aquaria is minimal. Avoid. Snails are great! I agree with you there. But I would recommend against the standard apple and mystery snails. They don't live for more than a year in aquaria because of their need for a "resting" phase once a year. Maintenance is do-able in specialist set ups that allow them to become dormant for a few months, but why bother? There are some excellent freshwater snails out there. Nerites are universally plant-friendly algae eaters without parallel, provided you get freshwater rather than brackish water species. They don't breed in freshwater tanks though, since their larvae are planktonic. Tylomelania spp. snails are also excellent, and at up to 12 cm/5 inches long, really impressive animals too. They're somewhat carnivorous, and like catfish pellets, krill, and the like. I think she meant to put mussels, not clams!